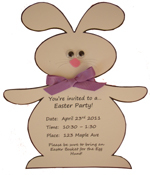 Start your party off right with these fun Easter Party Invitations! We got some fun ideas for do-it-yourself invites as well as some unique FREE printable Easter Party Invitations! There are some wonderful "do it yourself" ways to make Easter Party Invitations. We've got lots of fun, creative ways to get the word out! • Get the whole family involved by coloring these FREE printable Easter cards (and envelopes). Write the details of the party inside. • Use craft foam and hot glue to transform plastic Easter eggs into bunnies and chicks. For the bunnies use craft foam to make ears, feet and hands; use tiny pom poms or cotton balls for the nose and tail. Chicks are even easier to make - Similar to this chick napkin holder (also a great decoration/tableware for the party). Fold a note/flyer inside with the party details. • Buy some tiny baskets (dollar store or craft store), fill with jelly beans and a note inside or tied around the top with the party details. Wrap with plastic (wrap or baggie) and tie with a bow to keep the contents in place. Just add ribbons and a face for the bunny!